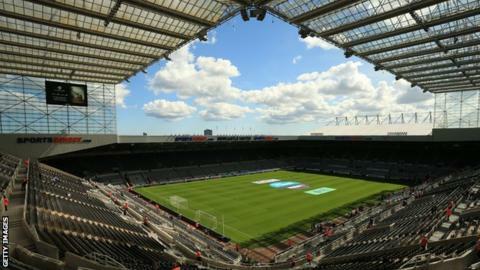 Newcastle United is being put up for sale at the "right time" by owner Mike Ashley and is in a "healthy position", according to a sport finance expert. Ashley bought the club, promoted to the Premier League last season, for £134.4m in 2007 and hopes to sell by Christmas. Newcastle turned over £126m in 2015-16 and Dan Plumley, a senior lecturer in sport business management, believes it is now worth "in the region of £300m". "It is an attractive proposition," Plumley told BBC Sport. Plumley, from Sheffield Hallam University, based his estimate on the club's match-day, commercial and broadcasting revenues plus the assets of St James' Park and the training ground. He also pointed to "intangible" assets such as Newcastle's fan base, history, players and manager, while their current league position of ninth helps drive the potential price up. "There are far more positives than negatives in terms of the standing of the club, the club is in a healthy position to attract a buyer at this point in time. "The timing of the sale and purchase is important in terms of where they are at the minute, they are in a good position league wise. "They have been a Premier League club for more years than not, and are now looking to stabilise back in the league and grow. The valuation creeps up based on league status, something a prospective buyer takes into account." Plumley also believes Newcastle's fan base - driven by the fact it is a one-club city - is an important part of the valuation Ashley can realistically expect. "From a negotiations point of view, the valuation will take into account their current position, their passionate fan base, the fact they sell out the stadium regularly, the high demand to watch games and their history. All those things push the valuation up. "The two biggest assets are that they own their stadium and training ground - that gives them leverage to push the value up. "Based on what we can measure - plus more intangible things - and on market trends, it is realistic to estimate £300m at this point in time." In the first four years, Newcastle paid net £4m in cash in transfers - 26 clubs spent more in that period. In the five years since, there has been a net spend of £114m on transfers. Only five clubs spent more - Arsenal, Chelsea, Liverpool, Manchester City, and Manchester United - over those five years.